Come help us kick off the weekend with a Pre-Party at the Tipsy Tomato located at the Rocky Mount Mills. 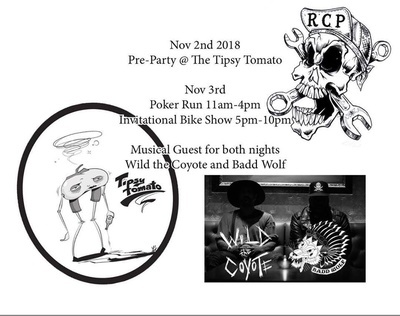 Live Music all evening, featuring Chet Nichols and The Repeat Offenders, Gnarly Nick, and headlining the night will be Wild The Coyote and Badd Wolf. A ride in bike show where a Peoples Choice and Judges Choice will be awarded and each winner will be invited to show their bike in Southern Drawl, Saturday night. Mark your calendars, this is most definitely one event you will NOT want to miss.